(AUSTIN, TEXAS – Feb. 22, 2018) – Multi-talented and beloved Texas artist Patricia Vonne announces the upcoming release of her seventh album, “Top of the Mountain,” out on Bandolera Records on Friday, May 25. Vonne has made a name for herself around the world as a multi-faceted musician, songwriter, actress, filmmaker and more. Now, with the release of her latest project, Vonne is positioned to once again enchant music lovers as she flows between genres and creates a sound only she could conjure. To check out a glimpse of a video of her new track “Tidal Wave,” co-written with Alejandro Escovedo, see here(password is “Tidal Wave”). There will be an official Austin album release show on Saturday, May 26 at the Continental Club, located at 1315 South Congress Ave. Patricia Vonne hits the stage at 10 p.m. followed by Joe King Carrasco at 12 a.m. For ticketing information, upcoming tour dates and more, please see: www.patriciavonne.com. The new album was produced, mixed and engineered by Rick Del Castillo and Michael Ramos, engineered by Joey Benjamin and mastered by Mark Hallman.The album features Vonne on lead vocals, acoustic guitar, castanets and electric guitar as well as special guest musicians Fort Worth sax virtuoso Johnny Reno, Grammy award winner Max Baca of Los TexManiacs on the bajo sexto, David Grissom, Grammy award winner Joe Reyes and Robert LaRoche on guitar and Scott Plunkett (of Chris Isaak’s band) on the keyboard. The album features co-writes with Joe the “King” Carrasco, Alejandro Escovedo, Willie Nile, Steven Medina Hufsteter of the Cruzados and longtime performing and songwriting partner Robert LaRoche. Vonne is currently promoting a PledgeMusic campaign where fans can pre-order the new album and receive many other benefits here. 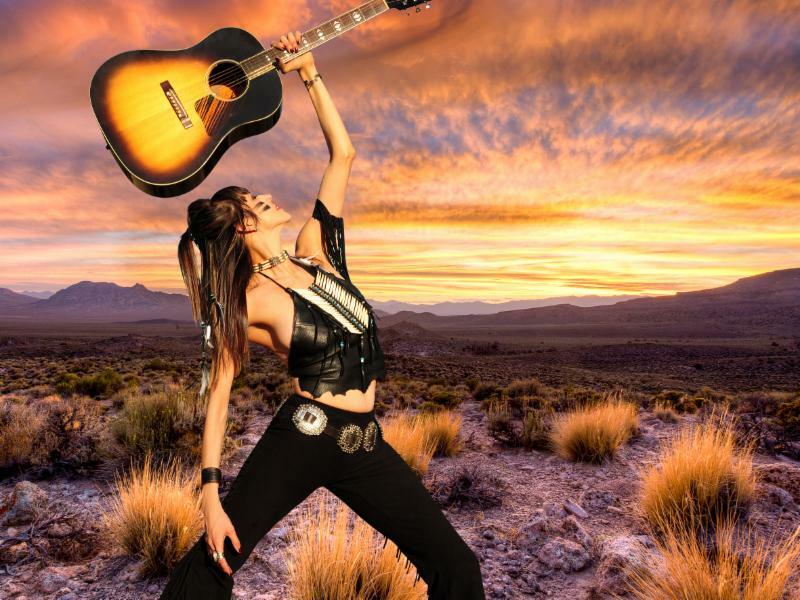 Hailed as a “Renaissance woman of Austin, Texas” by the New York Times,Patricia Vonne has claimed many titles in her illustrious career: singer, songwriter, bandleader, actress, activist and award-winning filmmaker. As one of 10 wildly creative offspring growing up in San Antonio, she and her siblings were encouraged to find their own creative paths. Exploring various artistic outlets throughout her career, she found herself immersed in writing, recording music and developing her musicianship. This ninth-generation Tejana “has absorbed just about every indigenous musical style Texas has on offer, and can summon anyone in the flick of a castanet or guitar pick,” notes the Houston Press. Noted as “an excellent singer songwriter” (Uncut) and “a beguiling storyteller” (Harp) with a “dramatic songwriting flair” (No Depression), Vonne is a one-of-a-kind “Tex-Mex spitfire with a Rock ‘n’ Roll heart” (Austin American Statesman). Now, with the release of her seventh album, “Top of the Mountain,” (by Bandolera Records) Vonne reaches new heights in her musical career. Following on the heels of her acclaimed all-Spanish album, 2015’s “Viva Bandolera” (which made the Top Eight list in the Huffington Post), Vonne’s new effort incorporates all the multi-faceted components that define her unique musical persona: rock, folk, flamenco, bilingual Tex-Mex and Latin strands that, taken together, form a rich and colorful tapestry. The defiant, stand-your-ground title track sets a declamatory tone as the rest of the album winds a sinuous path through the border radio groove of “Lil’ Lobo,” the careening rocker “Graceland Trip,” “Madre de Perla,” a flamenco-flavored tribute to Vonne’s mother, the spaghetti western soundtrack that is “Western Blood,” and much more. Featuring co-writes with Joe “King” Carrasco, Alejandro Escovedo, Willie Nile, Steven Medina Hufsteter of the Cruzados and longtime performing and songwriting partner Robert LaRoche, “Top of the Mountain” allowed Vonne to explore new aspects of her multi-cultural creativity. “Imagine a young Chrissie Hynde fronting the Mavericks with a little help from Calexico,” WORD. “A bilingual tour-de force melding eclectic with electric and exudes an elegance seldom associated with rock. Vonne is quickly taking her place among Texas’ musical treasures,” Austin Chronicle. “With a sultry, blood red vocal style and a dramatic songwriting flair, the strikingly exotic Patricia Vonne combines south-of-the-border mariachi sizzle, southwestern mythology, Texas roots-rock and spaghetti western cinematic sweep on this compelling bilingual effort,” No Depression. For more information on Patricia Vonne, please see: www.patriciavonne.com.